To upload a file to VirusTotal, you can visit the home site and use the main file scan form. You can make this process even easier with the free VirusTotal Uploader utility. After installing it, you can simply right-click any file under 32MB and choose VirusTotal from the Send To Windows menu. The scan results will be displayed in your browser as usual. Enough! I am sick and tired of reading, just let me install the utility, I will figure out alone how it works. 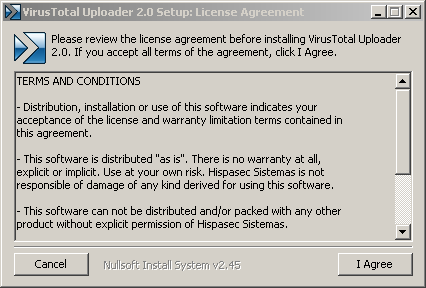 This document is intended for any user that wants to learn how to use VirusTotal Uploader. A simple Microsoft Windows Desktop application that makes the interaction with VirusTotal as easy as a right-click. No technical background is required in order to understand the document. Thus, this document is intended for Microsoft Windows users. Once the setup has ended you can close the installation window. If you selected the option of creating a desktop shortcut you should now see it in your desktop. 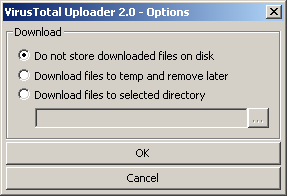 Even easier, just select the files you want to upload and drag them to VirusTotal Uploader's window. Some malware samples keep running in the system as ordinary processes, it is what the antivirus industry calls active malware. VirusTotal uploader includes a feature to help users in identifying active malware, the Upload process executable button. When clicked, VirusTotal uploader will try to find and read the process' image file and send it to VirusTotal. Another handy option will have VirusTotal fetch and scan an online file without you even having to download it first. Type in the URL, or right-click it and choose "Copy link location" to cut and paste it, and then click the Get and upload button. The file will skip through your computer's memory, but will never be saved to your hard drive (by default). You will get the usual list of results and can then decide whether you want the download. 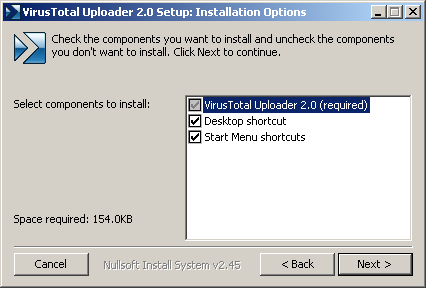 VirusTotal uploader can also be configured to download the files to a temp folder and remove them later or to store them in a specific location by clicking on the Options button. Since the vast majority of malware infections start with a web download or e-mail attachment, we believe the Get and upload option can prove itself very useful for users. Vul het e-mailadres in dat is gekoppeld aan uw VirusTotal-communityaccount. We zullen u dan een bericht sturen waarmee u uw wachtwoord kunt resetten. Kom in contact met andere VirusTotal-gebruikers en neem actief deel aan het bestrijden van de hedendaagse internetbedreigingen. Meer informatie over de VirusTotal-community.